You might like to try my video course Build a Blog Babe – it’s designed for beginners, starting from scratch and should resolve all of your confusion! Please download your purchase by clicking the download link provided where you purchased your theme. Please navigate to Safari > Preferences. Under the General Tab, uncheck the option “Open ‘safe’ files after downloading.” This will stop Safari from automatically unzipping the files. Next, please download your purchase by clicking the download link provided where you purchased your theme. 1. Go to your computer folders and find the zip file you saved to your computer. Unzip the file by right clicking on the zip file and choosing “Extract All” or “Unzip”. 3. Open the “Read Me” file which will take you through step by step how to use your web design kit. Importing the demo content just imports the dummy content from the demo (sample pages, sample posts and sample images) into your dashboard and can be helpful if your setting up a new site from scratch. But, you’ll still need to continue setting up your theme otherwise your site will be pretty bare! All WordPress themes just style content provided, so you’ll still need to configure your settings and tell WordPress where you’d like what. I would recommend going through the tutorials if you haven’t already in order to select all of your desired settings. You can display your whole post, or only a portion of each post with a link to continue reading. The designs can be used as-is like the theme’s demo, which the theme’s tutorials show you how to recreate. WordPress is very adaptable and anything can be accomplished. Kindly Note, I am unable to provide support for any theme customizations, code or custom CSS – this would be a DIY endeavour. The font sizes in your theme are determined by the font formatting you choose, eg. Heading 1, Heading 2, all the way to Heading 6. Alternatively you can override the themes font sizes by adding custom CSS. Kindly Note, I am unable to provide support for any theme customizations, code or custom CSS – this would be a DIY endeavour. You can definately edit, customize or remove the footer copyright and credits. I’ve written a tutorial to show you how here. The problem you describe just the installation order – Please upload the Genesis zip folder FIRST, BEFORE the Theme zip folder. As Genesis is the parent theme, the child theme will not be able to install without it. The first is that it’s trying to load elements that don’t exist yet – Please make sure Genesis is installed, the theme is installed and active, and all suggested plugins as described in the theme’s tutorials are installed and activated before you upload the demo content. The second could be elements aren’t being downloaded – Before running the import please check the “download and import file attachments” box. From there, the theme’s tutorials will guide you through step by step instructions to get your site started. If you’re having trouble with the instagram gallery try re-reading my steps in the theme tutorial to make sure you have the recommended settings and that your Instagram uername is correct. You’re welcome to research an alternate instagram plugin if you wish. As I recommend light widget (the app I suggest for horizotal galleries) and WP Instagram Gallery (the plugin I suggest for vertical galleries) I can’t gaurentee another instagram plugin will look the same as my theme demo. The theme tutorials will guide you through how to recreate the demo. It sounds like your header dimensions are way too big! I offer a Theme + Demo Install Service, where I will personally install your theme and set up your site like the demo. You can find all the details on the service here. If you are interested in collaborating me one on one to create a gorgeous custom-designed website, feel free to reach out via email and lets see what we can create! 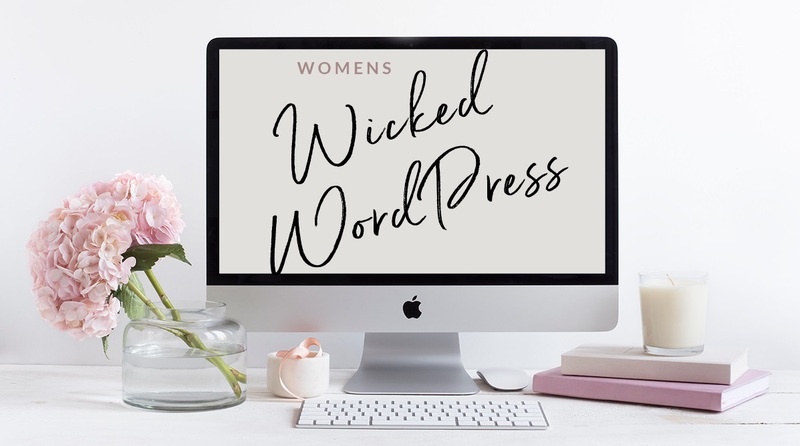 If you’d like assistance managing your website, It’s for this reason that I created my course Womens Wicked WordPress which shows you how to confidently manage, edit and update your site yourself. Starting from scratch and super confused? Try my course Build a Blog Babe – it’s designed for beginners, starting from scratch and should resolve all of your confusion! If you are using WordPress as a blog, then you will end up using posts for majority of your site’s content. Posts are blog post content entries listed on your home page or blog area of your website. Where as Pages are meant to be static “one-off” type content such as your about page, contact page and terms, etc. Anytime you’d like to add a feature that might be a bit tricky, I love to do a google search if there is already a free WordPress plugin for it – usually there is which makes it super easy to add a new feature to your site. No. If you’ve followed the email opt-in tutorial with a service like Mailchimp, when someone subscribes their email will go to your list. You can then manually create an email notification for your new post and send it to your list of subscribers. I’ve written a tutorial about adding images to your blog posts. First, when you publish any content in WordPress, it will publish those changes live, so anyone can view it online. So you could ‘launch’ after you set your theme up from the tutorials. Launching to me means when you ready for visitors to come to your blog and hopefully become a fan, but it could mean something different for each person. And I guess its up to you in which order you like to do things. 4 – Launch! Tell the world about your blog – start blogging, socialising and growing your audience. For lots of blogging tips and resources, I recommend checking out my Pinterest where I share the best tips from the international blogging community. Just as you back up your computer files with an external hard drive or cloud storage, it’s always a good idea backup of your website. I like to install an awesome plugin called BackUpWordPress. This will allow you to schedule automatic Backups and keep the 3 most recent backups of your site as all times. That way if anything happens to your site, you can restore it in one click! I offer a few ways you can work with me One on One with my Install Service and my Deluxe Design packages. First, make sure you check out the Theme’s Tutorials which will guide you through step-by-step how to set up your theme! If that’s still too much for you and you’re a bit confused, I recommend you see my course Build a Blog Babe – it’s designed for beginners, starting from scratch and should resolve all of your confusion! And if you’re overwhelmed by the thought of launching your website yourself, I offer a few ways you can work with me One on One: Install Services, Deluxe Design or through My Course. You’ll probably find that your question is answered immediately with the plugin authors’ own resources. If not, you might like to contact their support directly to ask your question. If you would like further help integrating eCommerce functionality with Woocommerce, I recommend the Woocommerce Docs for reference materials, documentation, and tutorials. My course Womens Wicked WordPress is a full website course that teaches you to how the site you already have works – how to use it, edit it, update it and add to it as your brand evolves. You can see all the lessons included here! It’s like I’m sitting right with you, guiding through Your Site, teaching you empowering skills (and all my tricks + tips) easily and quickly! I offer a few ways you can work with me One on One with my Install Service or my Deluxe Design packages. DIY Option – It can usually be solved quickly and easily by following my troubleshooting steps. Professional Option – I recommend WP Fix It, a 24/7 service, they will fix any WordPress error or issue for $39 flat, usually within just a few hours. If you believe a you have a theme-specific problem? We test our themes extensively and try our very best to catch any and all bugs before we release our new theme. If you catch something that’s not working properly or you aren’t sure about, please let us know. Support must be requested through the proper channels to be received and responded to. To request support, please contact us through on our Support Policy page. We are unable to respond to support requests sent through other channels, e.g. Etsy, Creative Market, direct email, etc.